Every year millions of people take advantage of the recreational opportunities Lake Allatoona provides. One reason for all the visitors is the fact there is a lot of lake to enjoy. When it is full Lake Allatoona covers more than 12,000 acres and has 270 miles of shoreline. The lake and much of the land that surrounds it are managed by the U.S. Army Corp of Engineers. 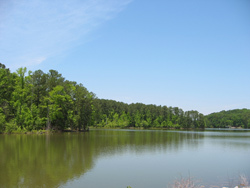 The Corp refers to the lake by its official name, Allatoona Lake, while everyone else calls it Lake Allatoona. There are 25,000 acres of public land around Lake Allatoona that are owned by the Army Corp. They maintain and manage some recreational areas along the shoreline but also lease land to private entities that provide services to the public. There are also public access properties and facilities around the lake that are managed by state and local government agencies. This site can help you learn more about what Lake Allatoona has to offer and also help you plan your next visit. At present you can find information about all the public campgrounds, the marinas, and some of the boat launches and day use parks. You can use the navigation menus found at the top, side, and bottom of these pages for specific information about a particular topic or scroll down this page to get an overview of the amenities that Lake Allatoona's has to offer. 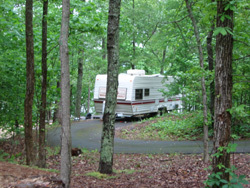 There are a large number of campgrounds around Lake Allatoona which means there is a wide range of camping services and amenities available. 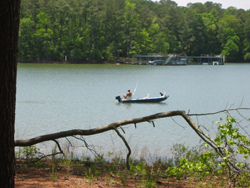 In addition to the U.S. Army Corp of Engineer campgrounds and Georgia's Red Top Mountain State Park, there are also facilities for overnight stays at Allatoona Landing and Holiday Harbor marinas. There are plenty of marinas, and boat related services, found along the shore of the lake. The eight marinas collectively offer services that include boat sales, service, rental, and storage. There are also restaurants, campgrounds, and other facilities found at some of the marina locations. Some quick facts about Lake Allatoona - The lake holds water that drains from 1100 square miles of land. The dam that created Allatoona Lake first began blocking the waters of the Etowah River in 1949. The total cost for creating the impoundment, including construction, land, clearing, and relocation, was $31,500,000 in 1950. The lake was created and authorized for flood control, hydroelectric power generation, water supply and water quality, recreation, and fish and wildlife management.